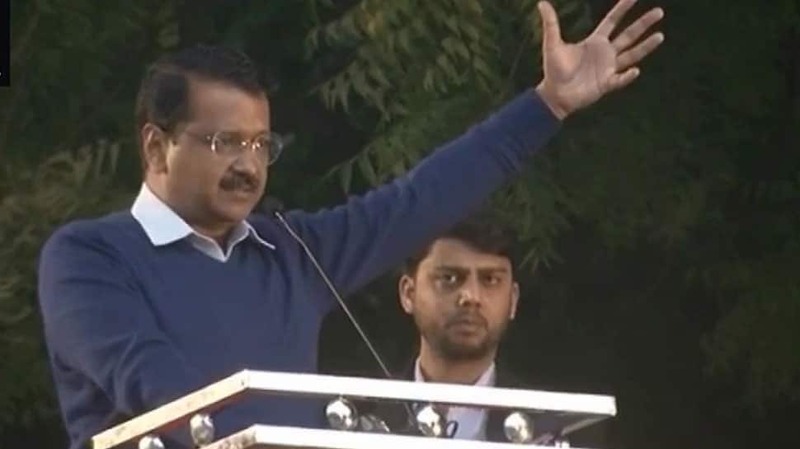 NEW DELHI: In an all-out attack on Prime Minister Narendra Modi, Delhi Chief Minister Arvind Kejriwal has urged the voters not to elect a Class 12 pass person for the country’s top job in the upcoming Lok Sabha election 2019. Kejriwal said this while addressing a mega Opposition rally at the historic Jantar Mantar rally. During his speech, Kejriwal said people made a Class 12-pass the prime minister of the country but they should not repeat the mistake in 2019. The Aam Aadmi Party supremo also charged PM Modi with being involved in corruption in the Rafale fighter jet deal. “Last time you made a Class 12-pass the prime minister of the country. Do not commit the mistake this time and find someone who is educated because a Class 12 pass (person) has not the understanding where he is putting his signs,” the AAP chief said, referring to questions raised on Modi’s educational qualification. Addressing the “Tanashahi Hatao, Loktantra Bachao” rally in presence of opposition leaders including Mamata Banerjee, Sharad Pawar and Chandrababu Naidu, Kejriwal asserted their protest-rally will uproot the Narendra Modi government. “This dharna will uproot the Modi government just as it removed the then government (of Congress-led UPA) in the country after the historic anti-corruption movement gathering at Jantar Mantar on April 4, 2011,” he said. Alleging that the Modi government purchased Rafale fighter jets at an increased price, Kejriwal accused the PM of directly responsible for price escalation. “Narendra Modi himself negotiated with the company of Rafale,” he said, waving a purported paper from a Defence Ministry file. He said if the truth behind Rafale deal were to be uncovered, the Prime Minister will have to resign. ”It has now been proved that PM Modi is involved in corruption in the Rafale deal,” he charged. “The West Bengal government is an elected government. It’s not a paternal right (bapauti) of PM Modi. If the commissioner was arrested, the message would have been conveyed across the country that one needed to fear the Modi government, not a state government,” he said. The Delhi CM hit out at the Prime Minister, accusing him of “tearing apart” Dr Ambedkar’s Constitution that provides federal structure in the country. The Modi government snatched away Anti-Corruption Branch (ACB), which had registered cases against high-profile people in the country, from Delhi government, with the help of paramilitary force, charged Kejriwal. “I want to tell the PM that Delhi is the capital of the country and he is not prime minister of Pakistan. Only Pakistan prime minister dreams of attacking Delhi and Congress,” he said. However, terming the opposition rally as a flop show, the Delhi BJP chief said that he will purify the venue with ‘Ganga Jal’ (Ganga water). “Those who were villains in Kejriwal’s list are his heroes today. He sat on a dharna at Jantar Mantar with the people who were called corrupt by him,” Delhi BJP chief Manoj Tiwari said. Stating that the BJP would observe February 13, marking the fourth anniversary of the AAP government in Delhi, as “Black Day”, Tiwari alleged that the national capital was “ruined” under Kejriwal’s rule.